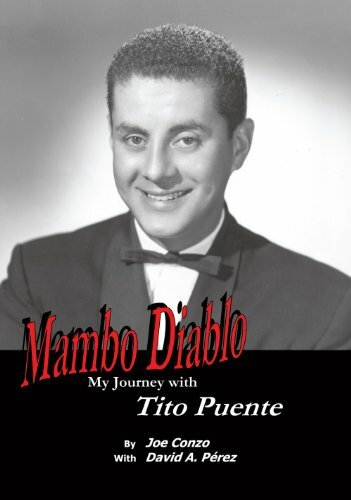 Conzo, Joe; Pérez, David A.
Synopsis: Joe Conzo and David A. Perez luminously recreate the life of widely acclaimed Afro-Cuban and jazz musician Tito Puente in the biography "Mambo Diablo - My Journey with Tito Puente." The authors chronicle the life of the popular and combative New York Puerto Rican multi talented musician and entertainer who climbed from his obscure and poor environment in East Harlem (El Barrio), New York to international fame and recognition. Countless stories have been written about Tito Puente's percussive musical abilities, but rarely has the talent, intuition, mishaps and controversies been presented in a vivid and personal biography. Joe Conzo was Tito's close friend, confidant and chronicler for nearly 40 years - no one was closer to Tito or knew him better, not even his family. Joe tells the story of a man and his music the way it has never been told. David A. Perez sets down Joe's personal recollections and fits them into the context of the social milieu and revolving world. Hundreds of articles have been written about Puente, and three books Powell, Josephine. Tito Puente - When The Drums are Dreaming, Authorhouse, 2007 (Information re: Tito is based on her conversations with Tito Puente. The book is self-published and chronicles many of his activities on the West Coast. There are many inconsistencies, mis-quotes, and errors of fact.) Loza, Steven. Tito Puente and the Making of Latin Music, University of Illinois Press, 1999 (A technical work that is based on interviews with people who knew Tito. The life of Puente is glanced over; the musicians he worked with are almost overlooked. Joe Conzo is among those interviewed.) Payne, Jim. Tito Puente - The King of Latin Music, Hudson Music, 2000. (Is presented as an overview of Tito Puente's music and includes a DVD with footage of Tito discussing his 50-year career. Joe Conzo provided much of the information for this endeavor.) record some of his achievements. None of them touch on the personal life of the man, expose his weaknesses, reveal his intensity for perfection, and describe the musical brilliance in such a delicate and personal way. Joe and David reveal the inner Tito Puente through his music, his musical associations and present a man that is more than a flamboyant percussionist. Tito played piano - and he played it well. Tito played the saxophone and often sat in the sax section of his orchestra. Tito played the vibes and had an incomparable style that was exciting, romantic and jazzy. He composed about 500 tunes, probably more. And, yet in the realm of American jazz historians, writers and critics ignore, brush over and avoid the importance of Tito's music and his contributions. A prime example of this is Ken Burn's television documentary about jazz - he virtually ignores Afro-Cuban music, Afro-Cuban jazz. Joe and David reveal Tito's rightful place in the history of music and give an unbiased, on-the-mark portrait of Puente's complexities like no book before it. Author and journalist Pete Hamill sets the stage for the journey in the preface. About the Author&colon; Joe Conzo was one of Tito Puente's closest friends and confidants for nearly forty years. Conzo is a chronicler of Puente's music and life. He is a noted music historian and producer and maintains a large collection of released and unreleased recordings that includes works of Puente and many others. Conzo contributes articles to numerous print and television outlets, and he is a consultant on numerous Tito Puente commercial endeavors. David A. Perez is a former political and sports writer for the San Juan Star in Puerto Rico and has worked as a journalist in Washington, D.C. He is a published author and is a historical researcher of Latin music. He is a devout music collector as well as an accomplished flutist.